VMM 11 – Time to go All In? As I mentioned yesterday due to health reasons I’ve decided to try and eat vegan and unprocessed for the remainder of July. My go to meal this last week has been simple – throw a cup of rice, 2 cups water, and a bag of southwest frozen vegetables in the rice cooker, wrap some in a small tortilla with a little salsa, and ta-da, dinner is served. Easy to make and easy on the stomach, it’s even OK without the salsa though it’s dry. My goal for this week was to find easy meals so good that I’d crave them. And I found some! Rinse the cashews, soak them overnight, rinse them again. Put them in a food processor, cover with water to about an inch over the cashews, and blend very, very well. Since it’s a base for so many things and freezable I made too much and froze some in mason jars to be used later. After all, easy as it is to make it’s even easier to pull it out of the freezer to defrost. I’m hoping to try an alfredo sauce with it, I’ll let you know how it works out. I found a recipe with great reviews to use cashews as a base for a nacho dip, so I made some of that too, modified slightly (I really over bought the cashews…). Basically you throw everything in the food processors and blend until it’s liquified. I stopped at this point and stored the liquid half in the fridge and half in the freezer. I’m guessing if cashew cream freezes well so will this. We shall see! At this point it is the consistency of water almost. I still dipped a chip in it and this stuff is amazing tasting! The end product is definitely more than the parts. To finish it up it should be heated up for about 20 minutes, stirring frequently. As I said I didn’t get this far and I’m already addicted to the taste. If I can have this for my burritos and such vegan just got a whole lot easier! My other big win came from The Simple Veganista, mashed chickpea salad. The name does not do it justice at all. I made it and thought well, it’s healthy looking. Then I tried it on a cracker and wow, delicious. I had the 13 year old try it, win. I made a couple modifications as raw veggies are out at the moment. Throw everything but the cashew cream in food processor and pulse. Leave the garbanzos chunky, not smooth like hummus. Eat with crackers or on a sandwich. It’s really, really good on crackers! I had some plain on spelt bread. It would be great with lettuce, tomato and onion. Also, it would have made a better picture that way! Warm the milk slightly, add all ingredients in order to bread machine, and set on basic. My bread fell somewhere in the final bake cycle, as it always does. It’s still soft, nutty and delicious! This entry was posted in Meatless Monday, Vegetarian by Kinda Zennish. Bookmark the permalink. We’re starting a detox today and so far so good! Went meatless yesterday and felt great! 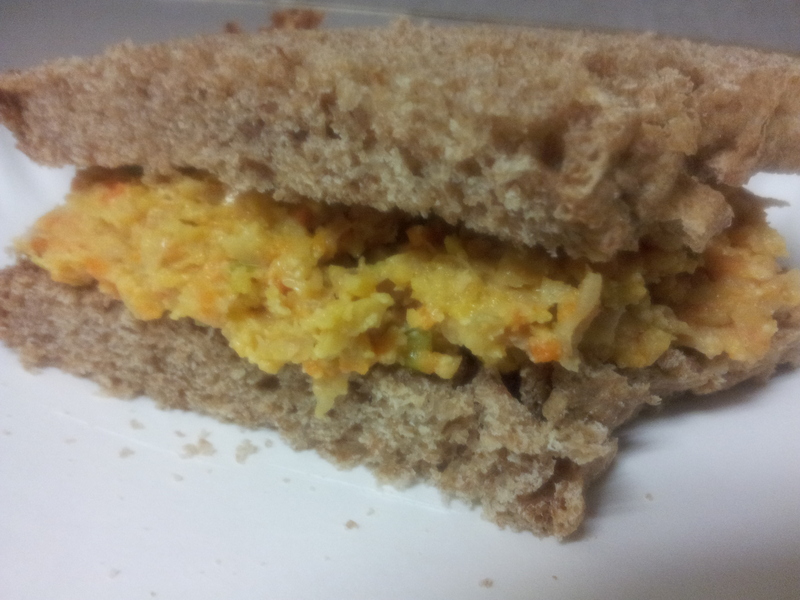 Chickpea salad sandwich? I am all in! I am not a vegetarian but do watch what I eat. In place of rice I eat quinoa. Your Chickpea Salad sounds good and I love cashews. I eat a lot of hummus. I take dried chick peas and let them soak overnight and then pressure cook them the next day. I add some calamala olives, lemon juice, fresh garlic and stir in blender until very smooth. I use this spread on everything. I love homemade hummus, but I’ve never tried it with calamala olives. I’m adding that to my list of to-dos!